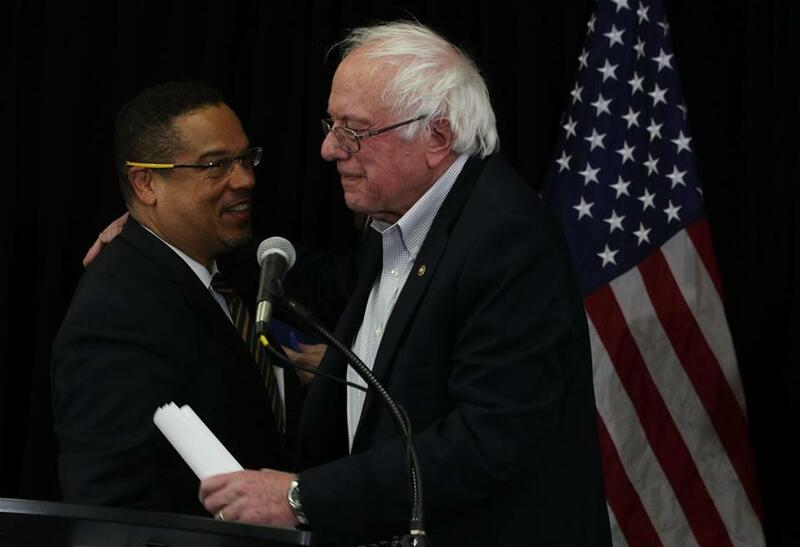 Representative Keith Ellison and Senator Bernie Sanders. The Democrats were given one great gift last year. Even as they lost state legislatures and control of the Senate, even as they surrendered governors’ mansions and somehow turned over the White House to a moral midget, one thing broke their way. And if they squander it now, as their establishment leadership seems inclined to do, then shame on them. That one great gift was the cascade of young voters that poured out in support of Bernie Sanders. Early in the primary campaign, I introduced the Vermont senator to a crowd of nearly 30,000 people in a big-city convention hall. They were almost all millennials, and they were roaring — any fear I had about the supposed apathy of youth vanished that night. That scene repeated itself across America. By the time primary season was over, Sanders hadn’t just swamped Clinton among young voters — he’d gotten 35 percent more young voters than Clinton and Trump combined. Nothing like that has happened in my political lifetime. It demonstrates that an honest, bold message, paired with a leader who passes the authenticity test, can move young people into political action. And that should thrill Democrats. Broken as the party is at the moment, demographics means that, indeed, young people are the future. And cynical as they are about politics, they are not lost to the party. Which is why it was exciting to watch Keith Ellison’s candidacy for party leader take off this fall. Not only did he work closely with Sanders (who remains America’s most popular politician) but he’s cut of the same cloth. Not literally — he’s short, black, and Muslim, instead of tall, white (and white-haired), and Jewish. But he speaks the same language and with the same urgency — he understands the depth of the problems faced by young and working people. I got to watch him up close during the marathon hearings and negotiations over the Democratic platform last spring. Some of the participants in that process were, to put it politely, veterans of Democratic politics, repeating bromides that had perhaps worked once but no longer do. (Having watched that process, I was not surprised by the lackluster presidential campaign.) Ellison — a sitting member of Congress — was polite, respectful, and attentive. But he was also firm and urgent. He wasn’t going through the motions. Which is, I think, why the most ingrained parts of the party establishment are now trying to break his momentum. They’ve put forward Thomas Perez, a perfectly good man but from the ruling wing, not the organizing wing, of the party (he’s never been elected to anything above a county council). And, sadly, they’re playing dirty, or at least cynical, digging up “controversies” like ancient parking tickets from Ellison’s past, or a newspaper column he wrote in college defending the Nation of Islam’s Louis Farrakahn. Voters in his congressional district have thoroughly rejected such nonsense, and so should the DNC members, but the same party machinery that clearly disliked the Sanders challenge (remember those e-mails showing senior officials debating whether it would be more effective to smear him as a Jew or an atheist?) is now trying to derail Ellison. These insiders view the Democratic party as a club or an institution, not as an organizing platform. And we’re not in an age when institutions are particularly useful — we’re in an era when institutions, without an infusion of new blood and ideas, simply fade away. I know this in part because I’m a Methodist, once perhaps America’s most vital Christian denomination. But over time its energy bled away — despite plenty of vibrant local congregations, and despite sporadic attempts at top-down rejuvenation, it has steadily ebbed. The average age of a Methodist is now 57. One way to imagine the Sanders campaign, then, is as a series of revival meetings, conducted in every corner of the country. There was nothing shallow about them — Sanders’ unique form of charisma stemmed from his slightly grumpy seriousness. And so the support he received demonstrated a fervent desire to participate, especially among young Americans. They were serious about change. That energy won’t disappear — it’s already powering the new civil rights movement and the fight for climate justice. But it will disappear from the Democratic Party if the party doesn’t seize the opportunity that Ellison offers. It won’t be the fault of the Russians or the FBI. And it may not come again. Bill McKibben cofounded the grass-roots climate campaign 350.org and is a distinguished scholar in environmental studies at Middlebury College. He was a member of the Democratic Party platform-writing team in 2016. Correction: An earlier version of this article erroneously identified Congressman Keith Ellison as Ralph Ellison.